Dogathon 2019, SPCA’s Wow-Woof Walk! Gear up for Dogathon 2019, a doggie fun day! 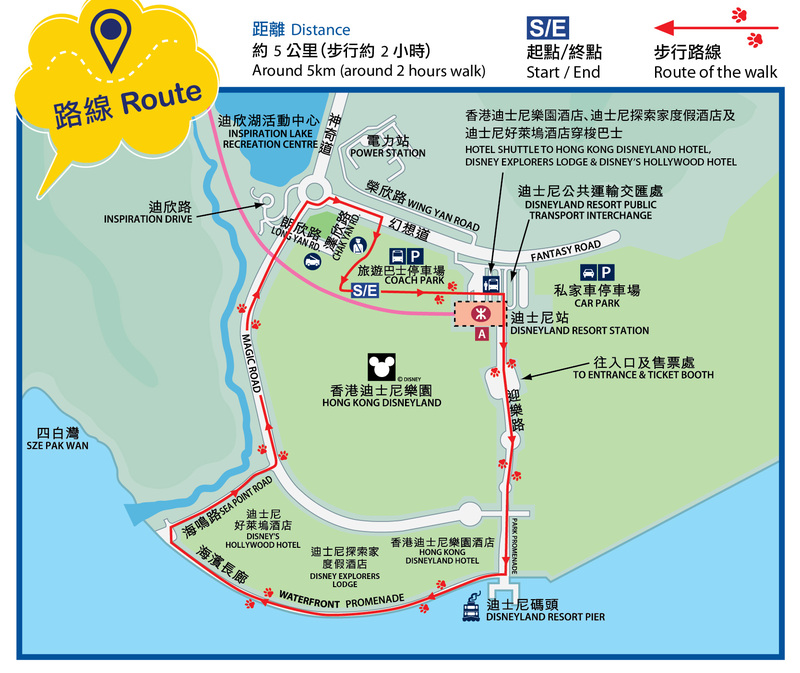 SPCA’s upcoming Dogathon 2019 will be themed “Go for a Walk and Turn Hong Kong Upside Down“! Paying tribute to Hong Kong’s most distinctive district landmarks, their venue will be transformed into a hub of selfie spots featuring the cities most cherished icons. Now you and your furry friends can take all the selfies you want at one stop! After a walk along the beautiful water promenade with 1,000 pawpals, you can dive right into their super pawty. What a great way to spend a day while doing it for a good cause! Each participating doggie will be rewarded with a unique limited edition medal, as well as a commemorative bandana, a certificate and a goodie bag. And there are feature points created by local illustrator Ivan Yip, a PET X handicraft market and a Paw and Friends mini concert. No enrolment fee will be charged, just simply raise the minimum donation before the deadline to come and join in on the fun! What are you waiting for? Enrol now and join SPCA for a great day out, whilst supporting their animal welfare work! Everyone’s a winner especially the animals! Time: 8:30am, shuttle buses are available. Enrollment: To find out more about the rules and to enroll please follow this link. About SPCA: The Society for the Prevention of Cruelty to Animals was first formed by a group of volunteers in 1903 and became active in 1921. Although they are the first charity in Hong Kong to deal with all aspects of animal welfare, SPCA obtains around only 1% of our funding from the government. The rest of their funding comes from the generosity of the general public, for which they are extremely grateful. It is a constant challenge to raise the funds necessary to continue their work. SPCA believes that animals are living creatures which like humans, are able to feel pain, hunger and thirst. We should not inflict any suffering upon our fellow creatures just because they can’t speak. PETA’s Pints for Pigs – an awesome night of craft beer tasting to celebrate the New Year and help animals. At this fun event, you’ll get the first taste of H.K. 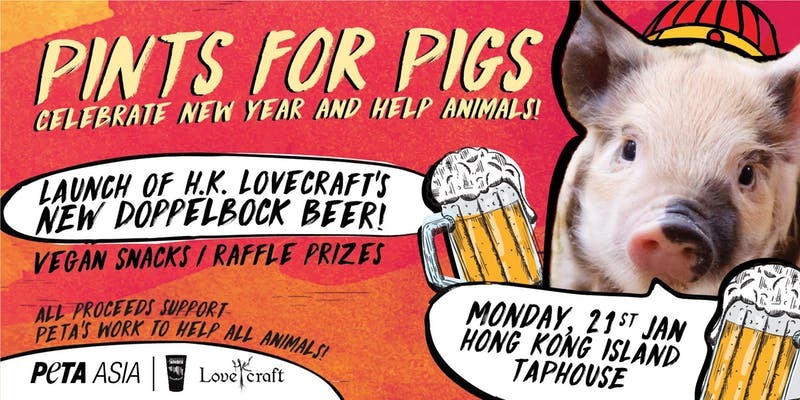 Lovecraft’s Doppelbock beer at the launch of this new brew, get a chance to win exciting raffle prizes, and hear all the latest exciting news about PETA and their campaigns. Every ticket includes your choice of six beer tasters (120 ml), two pints (500 ml) or three non-alcoholic drinks, vegan snacks and entry into a raffle. All proceeds will support PETA’s work for all animals. Price: $248, to register, please follow this link. The entrance fee is $288 for walk-in participants. About PETA Asia: PETA Asia was established in Hong Kong at 2004 and is an affiliate of PETA US, the world’s largest animal rights organization. PETA US and its affiliates have over 6.5 million members and supporters around the world. PETA Asia and its international affiliates are dedicated to establishing and protecting the rights of all animals through public education, cruelty investigations, research, animal rescue, legislation, special events, celebrity involvement, and protest campaigns.